Designing, building, or updating a theatre space is just the first step in achieving maximum results for performances. 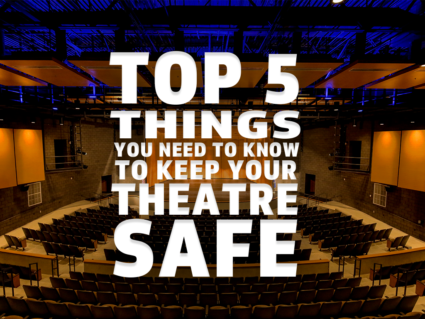 Just like a car needs regular service to stay running and reliable, a theatre requires proper maintenance to keep it safe and fully functional. We rely on our J.R. Clancy TIM® (Training, Inspection, and Maintenance) program to help simplify the maintenance process and extend the life of performance spaces while also ensuring the safety of theatre performers, staff, and students. To make sure your performance space is in top shape for the season, we worked with our service experts at J.R. Clancy to create this five-point list to guide you through the process. Most theatres have training for general rigging and control systems when a brand-new project closes. But even theatres that have been open for several years or decades can benefit from regular training sessions. Annual training on rigging equipment and motion control systems provides your theatre staff and system operators with both the expertise to operate the equipment safely and the valuable information they need to identify potential problems before they become serious. Our J.R. Clancy training sessions with an ETCP-certified specialist include essential aspects of operations, like identifying altered or damaged equipment that needs attention. They also ensure that your crews have the knowledge required to operate your theatre systems and keep them in perfect working order. The American National Standards Institute (ANSI) has been dedicated to developing voluntary consensus standards across products, services, systems, processes, and personnel since 1918. We strongly encourage adhering to their high standards in your performance spaces and keeping the safety of your students, faculty, staff, performers and audience top of mind. ANSI’s recommended guidelines for rigging inspections call for LEVEL ONE inspections annually and LEVEL TWO inspections every five years. LEVEL ONE inspections. These inspections cover manual rigging systems, including counterweight and fire curtain systems. LEVEL ONE inspections are performed from accessible areas, like rigging galleries, catwalks, facility ladders, and gridirons, or from the stage floor where no accessible positions exist. LEVEL TWO inspections. This inspection covers all set components (even lifting media) by gaining access with ladders, scaffolding, or personnel lifts to all rigging components. When the last inspection date is unknown — or if there are new, altered, motorized, or repaired components or equipment — it is recommended to schedule a LEVEL TWO inspection immediately. Whether your equipment is brand-new or 30 years old, regular maintenance can address simple fixes before they become larger issues. Through our TIM program, we offer a full aftermarket service program, equipment estimates, support warranty claims or impromptu problems, and even send technicians into the field to take care of emergency issues that arise during production. Safety and operations issues can occur because of equipment failure, human error, accidents, or because of age. When counterweight rigging equipment reaches 25 to 30 years of age, it can be worth updating your old or outdated system to simplify the production process, enhance your performances, and keep your programs running smoothly. Newer systems offer numerous advantages, including the ability to easily set up different cues and completely different shows on a computerized system. These motorized systems also simplify the maintenance process with programmed reminders for inspections that help you track your unique service needs. Our performance space inspections by experienced, J.R. Clancy inspectors are based on ANSI guidelines. These qualified, ETCP-certified, rigging inspectors are experts at identifying backstage environments or equipment installations that can cause safety issues. Their advanced expertise also helps identify potential problems to minimize repair costs and avoid the risk of injuries or expensive damage. We also believe in upholding ANSI standards and work closely with our customers to take the necessary steps to protect their theatre equipment investment and reduce their liability risks. As part of our TIM program, a certified inspector provides a detailed report outlining any items requiring additional attention. This report includes items that may need to be upgraded and equipment that should be removed from service, as well as items that need ongoing monitoring. Your inspector also provides transparent estimates related to any potential expenses. All of our technicians are highly trained to handle any job from simple repairs to complex issues like troubleshooting, upgrades, or renovations. For more information on the benefits of theatre training, inspection, and maintenance, contact J.R. Clancy today.